Melt the butter in a large pan and sauté the onion, garlic, ginger and mint. Add the rest of the ingredients, season to taste and bring to the boil. 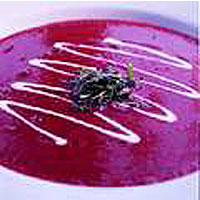 Cover and simmer for 1 hour, or until the beetroot is completely soft, then purée and serve with sour cream and the shredded herbs.